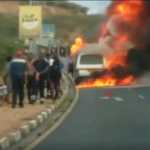 The driver of a minibus sustained severe burn wounds after the vehicle he used to transport passengers between Windhoek and Groot Aub burst into flames. According to an eyewitness the bus broke down near the turn-off to State House in Robert Mugabe Avenue. The driver crawled under the minibus in an attempt to find the cause of the engine failure. Some of the passengers helped him to escape from under the vehicle and ran for their lives when fuel in the tank started burning. The Windhoek Fire Brigade arrived on the scene soon afterwards to extinguished the burning wreck. The fire fighters also assisted the injured driver until an ambulance arrived to transport him to hospital.